Last weekend I took a trip to Zakimijo, or Zakimi Castle, in Yomitan City. The castle site was constructed by renowned fortifier Gosamaru in the early 15th century. He was an aji, or lord, ruling the Yuntanja (present day Yomitan) area, who, led by Sho Hashi, took part in the seizure of Hokuzan castle in Nakijin Village and played a significant role in forming the first unified Ryukyu nation. The castle is said to have been built by Gosamaru while he served as a Hokuzan-kanshu. Before the united Ryukyu kingdom came into existance, the island was controlled by what was known as the Sanzan--san meaning three and zan means mountain or area. The island was divided into the Hokuzan area in the North, the Chuzan in the middle, and the Nanzan in Southern Okinawa. Kanshu can be translated as 'guard'. Combined, Hokuzan-kanshu means guard of the North. When seen from above, the castle walls are distinctively arced and arched stone gates serve as doorways throughout the site. 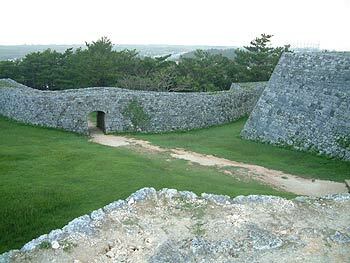 Many castle sites on Okinawa have a similar appearance, but Zakimijo has a keystone at the ceiling of each arched stone gate not found at other castles. This added keystone provided extra strength to his castle gates. Gosamaru was surely an esteemed fortifier and ahead of his time in his craft. As I mentioned, Gosamaru served as an aji in Yuntanja during the 15th century. Before Zakimijo was built there was a castle called Yamadajou about four kilometers Northeast of Zakimi in which Gosamaru ruled over. 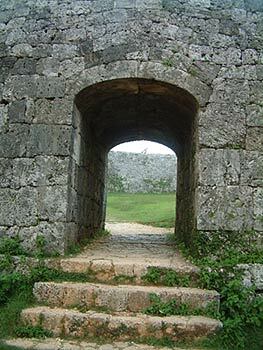 However, he took apart the castle walls, transported the stones, and built Zakimijo with them. He built Zakimijo high in the north part of Zakimi village in Yomitan City. When you visit the castle site, you'll notice there is a broad view of much of the Yomitan area from the castle walls. It is little wonder why Gosamaru chose this spot to lay his fortifications. During zakimijo's construction, locals and Amani island residents were gathered together to help build the castle walls. 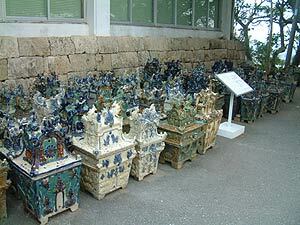 In past years, much Chinese ceramic ware has been found during excavations of the castle site giving insite into the old Ryukyuan culture. If you visit the Zakimi Castle site, you'll see a small museum on your right as you approach the staircase leading to the castle walls. Here, you can find out more about the castle as well as see and learn about other Okinawan artifacts. During my visit, the museum had several Zushigame funeral urns on display as well as an old sugercane press. I was able to learn quite a bit from the signs posted nearby. The museum is open from 9 a.m. to 5 p.m. daily and admission is ¥200 for adults and ¥50 for children. Driving to Zakimi is very easy. Drive north on highway 58 past Kadena Airbase. Continue north past Kadena Circle. A few kilometers ahead, you'll see a sign announcing rt.6 on your left. If you turn here, you'll see signs right away announcing Zakimi Castle. Follow these signs and you'll be guided right to the parking lot. However, if you stay on Highway 58 and pass the first turn for rt. 6, you'll see another turn for rt. 6 a few kilometers ahead. Turn right at this intersection and you'll be very close to the castle grounds. Follow the signs and you'll be guided right to Zakimijo.